Last weekend Ben and I ran a marathon. Well, not really ran. And we did it barefoot. I didn’t even put a sports bra on. In fact, our marathon didn’t involve running at all. Instead, it involved swapping out 6 awful builder-grade faucets for new only-slightly-more-expensive replacements. I say “marathon” because it literally took us all day and any amount of mental strength we could muster up. I wanted to quit several times. But we endured and get ‘er done. Most of the day Ben spent on his back under a sink. It was really hard for me to refrain from poking or tickling him while in that position. Travis even got in on the action. He wanted to help so badly, so finally I was like, “Sure! How about you start taking the old fixture out?” I never thought he’d be able to figure it out, but that kid is sharp. He ended up being a huge help and turned off the water and undid all the old fixtures before Ben came in behind him and put in the new ones. I initially had given him this busy-work task just so he’d leave us be, but in the end we were grateful to have his help. Here’s where we started. Pretty basic. The plastic knobs were doing nothing for me. And here’s what the new one looks like. So much better. We have 5 bathroom faucets in this house, so we didn’t want to break the bank on something ubber-expensive. 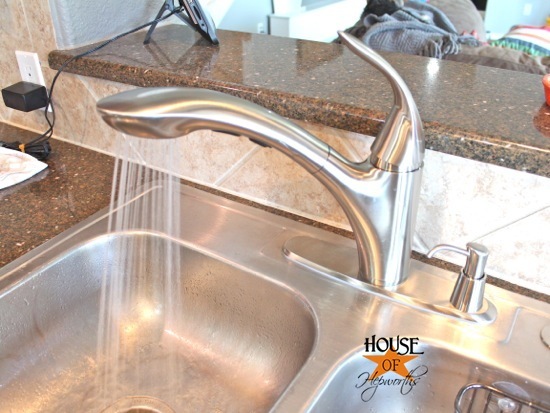 We found these Glacier Bay faucets in brushed nickel at our local hardware store for only $28 each. 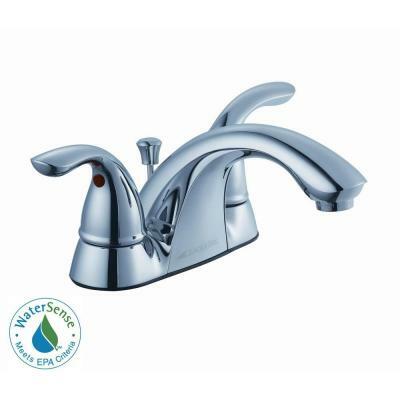 For $140 (plus tax) we were able to purchase all five faucets. I’m sure they aren’t the best quality faucet on the planet, but they are much prettier than the original. Here’s the Master Bathroom with the new faucets. It would have been awesome if I pushed the garbage can behind me while snapping photos. Oops. At least I picked up the dirty undies off the floor. Reflection photos are always fun. 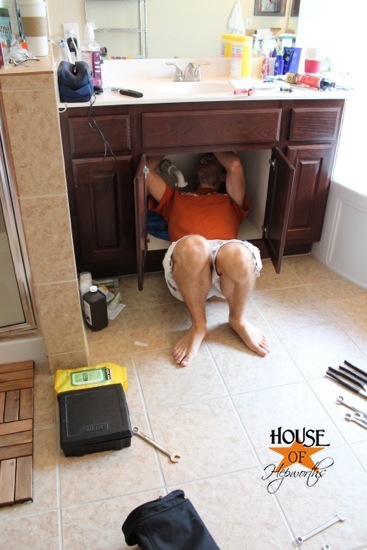 In addition to installing the new fixtures, I am very eager to get working on doing something (anything!) with the following two bathrooms. They are beige on beige on beige and need some sprucing up. In addition to all the bathrooms we also swapped out the kitchen faucet. 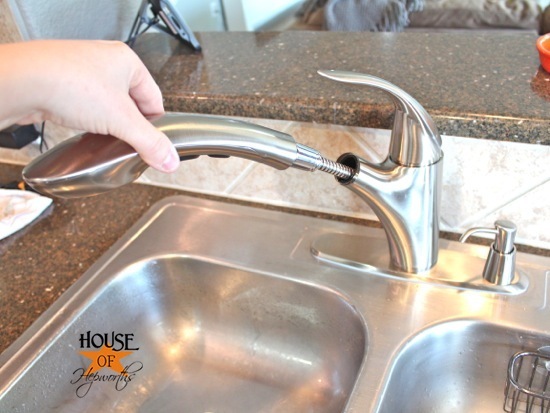 TWO years ago I added a nozzle to my crappy kitchen faucet as a temporary fix until we replaced the entire faucet. Little did I know I would use that awful fixture for two more years. While at Costco I found this fixture for only $79.99. It isn’t on Costco.com so I can’t link to it, but I just bought it there last week. I found some on amazon for $109.99, so get it at Costco if you want one. 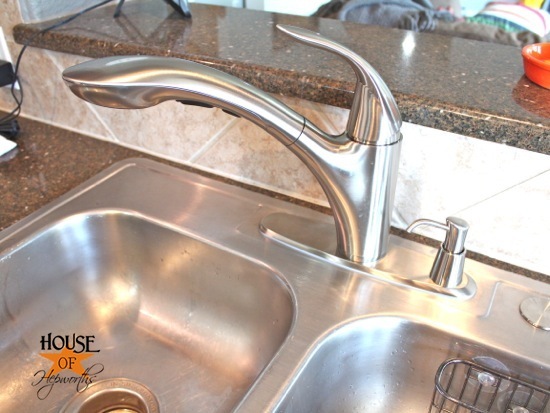 It’s called “Water Ridge Patrician Series Kitchen Faucet: Brushed Nickel”. I had my eye on a different faucet at the hardware store that was over $200, but when you find one for such a good price (less than $80) it’s hard to resist. It’s funny how price will change ones priorities all of a sudden. After living with an apartment-quality fixture for over two years, this is a welcome change. 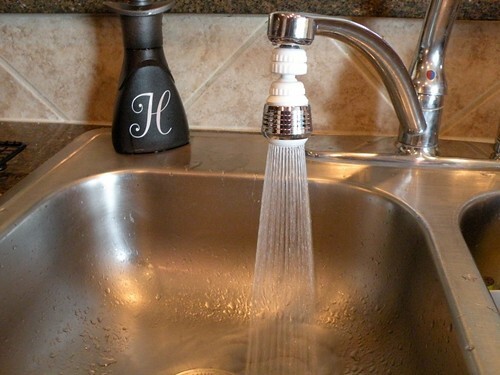 The faucet does a basic stream, a spray, and the end of the fixture pulls out as well. As an added bonus it came with a little soap pump. My only complaint so far is that the fixture is too good. Really. The water comes out much faster than the old crappy fixture so I have to barely turn the water on or it sprays everywhere. So ya, the faucets “weaknesses” is that it sprays too well and the water comes out too strong. When we bought this house Ben said it was “finished” and wouldn’t need any work. I told him I can find 10 years worth of work in this house. I think he’s starting to believe me. 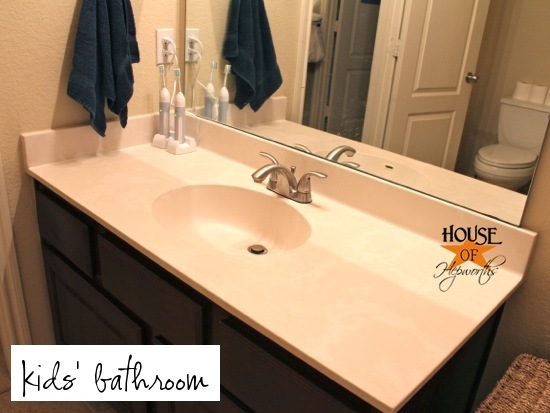 I’m SO jealous of your bathroom!! 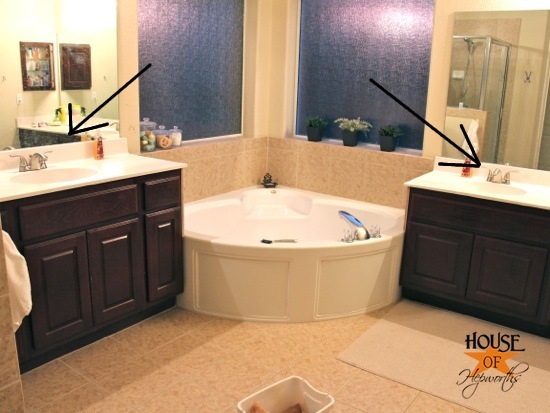 LOL Love that corner tub and your faucet choices are right up my alley! I love that clean slightly modern look! The new faucets look GREAT!! 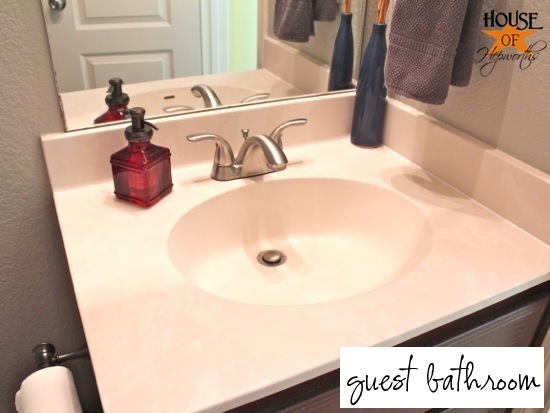 I am in the process of finishing our guest bathroom update and believe me … what a difference a couple of new fixtures can make!!! 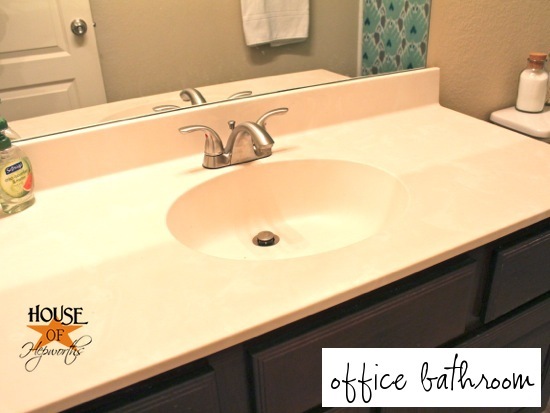 Now we just have to get a new counter and sink and we should be good to go:) Maybe we will think about replacing the shower door down the road but for now, with the builder grade mirror, vanity and hardware replaced I can totally live with it!!! We live in a older home with a kitchen sink that is 6″ deep. No matter how hard we try to only turn the water on a little, it sprays everything. I fixed this by turning the shut-off valve under the sink just slightly. It really makes a difference! This is a great idea! 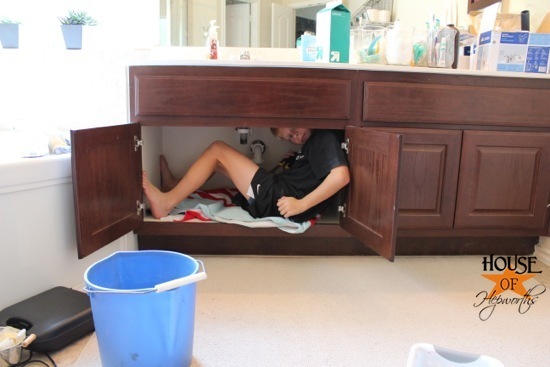 I think I’ll try this until I can afford a deeper sink. 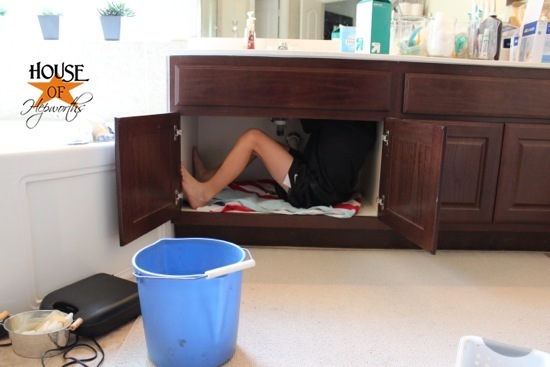 I did the same in my apartment… Thank God for good water pressure! My kitchen faucet has been downgraded 🙁 I live in a rental, previous tenant installed a nice Moen faucet with pull out sprayer, very much like yours. It broke and landlord being the cheap thang he is, installed a very basic old school faucet much like your previous one. 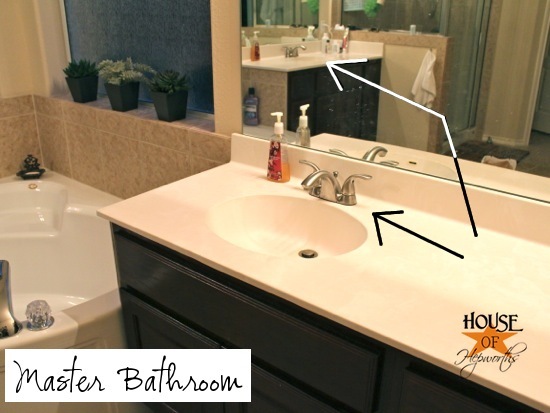 Now I am on the hunt for the little swivel sprayer add-on, just so I can reach the far corners of the sink w/o having to use a cup or my hands to rinse. 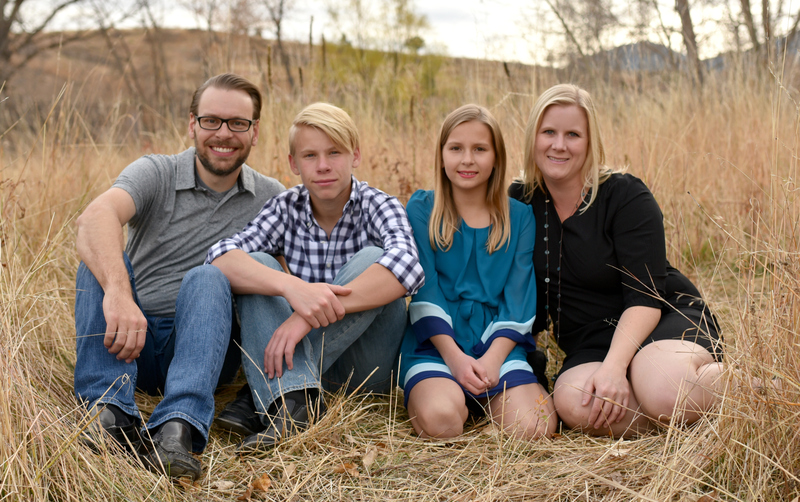 When we finished out our basement a few years ago, we had a plumber connect all the plumbing up. This in my beautiful custom tiled bathroom I just finished. I walked in and saw those gnarly plastic knobbed thingies in the shower and on the granite countertopped sink and almost game unglued! I just looked at him and said – take them out. I went to the Depot and got some similar to yours. Not outrageously expensive but definitely way more attractive. That plumber just couldn’t understand why I didn’t like his! What is it with men? “If it works, its fine”. NO IT’S NOT!!! Isn’t it amazing what a new faucet can do for a place??? They look great! By the way, I have the same faucets as in your bathrooms. While I was building/remodeling I chose them for the same reasons $ and good looks! It’s 7 years later and I have not had ONE problem with them! i have the same glass “antique” soap pump that you have in your guest bathroom. mine is clear and taller – bought it from Kirklands. i use mine in my kitchen in place of the horrid plastic dishwashing liquid bottles. it really dresses up the counter and goes much better with my french country decor! Oh my gosh! I really really REALLY need to do this. 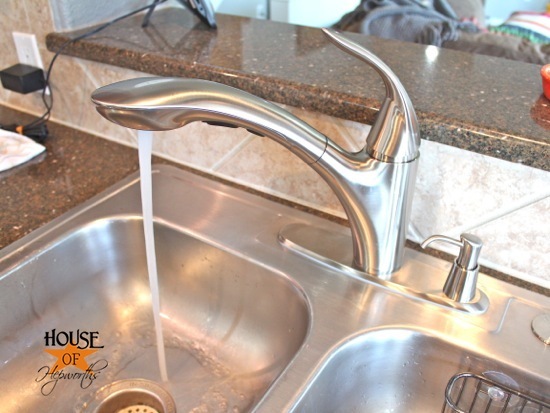 We have a bunch of ugly faucets that you your knuckles hit the sick while washing and the kitchen faucet looks like it belongs in a haunted house!! 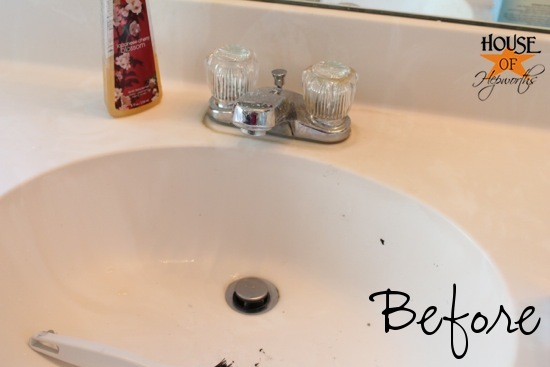 Amazing how much difference a faucet makes. How on earth do you keep 5 bathrooms clean?! Wow! 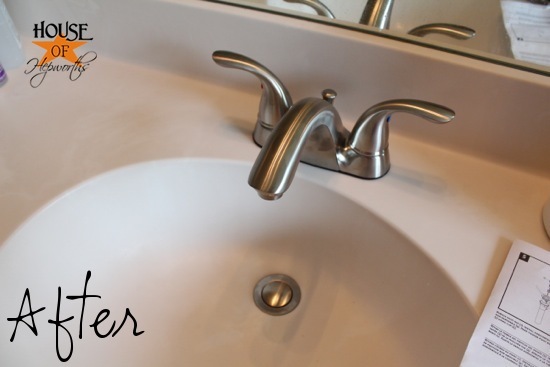 I didn’t realize how much of a difference a faucet could make, but now I’m totally thinking we need new ones too! 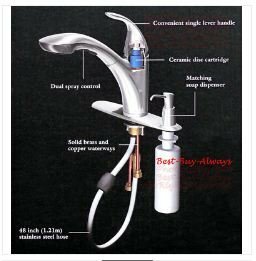 Great choice for the kitchen faucet, I have one of those and it is the best for cleaning the sides of the sink, bathing the dog and for filling buckets that are taller then the faucet. Thank you for the review. 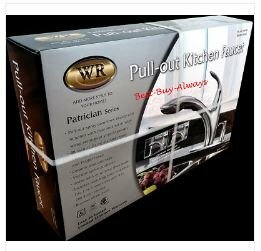 I just purchased two Patrician faucets for new kitchen (Costco 609030: $79.99 less $20.00 instant rebate = $59.99); have not yet installed them. I’m glad to hear the water deliver is forceful. I was concerned about wimpy spray, in particular. Old Delta faucet with traditional black plastic separate spray will cut through the whipped cream cheese residue on a dinner knife (after spreading cheese on bagel). Old spray is more concentrated than Patrician, because of smaller spray head. Will the Patrician cut the cheese? Nope, just bad photography I guess.